Mario Joe and Luigi Bob are two cousins of Mario and Luigi; described as both hicks and country bumpkins, Mario Joe and Luigi Bob, aside from their clothing, look completely identical to Mario and Luigi. Near the start of The Super Mario Bros. Super Show! 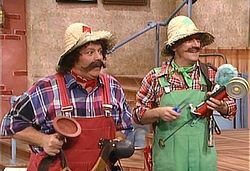 episode "Mario Hillbillies", Mario and Luigi are waiting for both Mario Joe and Luigi Bob to arrive at Mario Brothers Plumbing so they can all go on a fishing trip. Eventually, the impatient Mario Bros. decide to leave without their tardy cousins, and Mario leaves a note for them, explaining where he and Luigi went and telling Mario Joe and Luigi Bob to make themselves at home in the apartment. Just as Mario and Luigi left Mario Brothers Plumbing through a back entrance, Mario Joe and Luigi Bob arrive through the main entrance. Noticing that Mario and Luigi are not home, Mario Joe and Luigi Bob find Mario's note on the apartment's scarecrow. Upon reading aloud the part of the note that tells them to make themselves at home, Mario Joe and Luigi Bob let out a joyous yell and run over to Mario and Luigi's refrigerator, which they begin to look through. Later, Mario Joe and Luigi Bob begin to relax at Mario and Luigi's table, eating large amounts of food from the fridge. After some small talk involving what pepperoni is and where it comes from, Mario Joe and Luigi Bob hear the doorbell of Mario Brothers Plumbing; and after some hesitation, yell for whoever is at the door to come in. A woman enters and asks if Mario Joe or Luigi Bob have a faucet, as she is in need of a new one. As Mario Joe tells the visitor that he is not sure and prepares to inform her is not actually Mario, Luigi Bob stops him, saying he is not sure if there was a faucet in the plumbing shop at the moment. As the visitor broods over her bad luck, Mario Joe tries to cheer her up, prompting the visitor to introduce herself as Ellie Mae and ask their names in return. Stuttering, Luigi Bob introduces himself as Luigi, while Mario Joe introduces himself as Mario. Upon learning the two's supposed names, Ellie Mae tells Mario Joe and Luigi Bob that they are just the kind of plumbers she's looking for: country bumpkins, like her. Afterwards, as Ellie Mae plays with the Ratigator (who Mario Joe and Luigi Bob call Zeke and Luke) Mario Joe and Luigi Bob begin trying to put on tool belts and gather up various plumbing equipment. As Mario Joe and Luigi Bob struggle, Ellie Mae tells them how kind they were to make a house call for her, but she is beginning to show doubt in their abilities. Mario Joe and Luigi Bob reassure her and say it was an honor to fix her plumbing. Charmed, Ellie Mae decides to have Mario Joe and Luigi Bob stay over for a possum dinner, then they all leave for her house.